Two Scholars enter and linger outside Faustus's house. One wonders what became of Faustus, who was once was famous for his passion for logic. The scholars stand in for the academic university environment within which Faustus lives, where knowledge and argumentative skill are prized. The Scholars catch sight of Wagner, who enters. They question him as to Faustus's whereabouts, and Wagner hedges, mocking their academic language before finally revealing that Faustus is at dinner with Valdes and Cornelius. Wagner exits. The scholars' educated status allows them to feel superior to the servant Wagner. Wagner mocks them by aping their academic language, showing that he too can talk like a scholar when he wants. The Scholars bemoan Faustus's turn towards necromancy, and resolve to inform the head of the university of this development. They both exit. Like Faustus, the scholars value knowledge and learning. But, unlike him, they will not resort to necromancy to gain knowledge. Fredericksen, Erik. "Doctor Faustus Scene 2." LitCharts. LitCharts LLC, 3 Nov 2013. Web. 25 Apr 2019. Fredericksen, Erik. "Doctor Faustus Scene 2." LitCharts LLC, November 3, 2013. 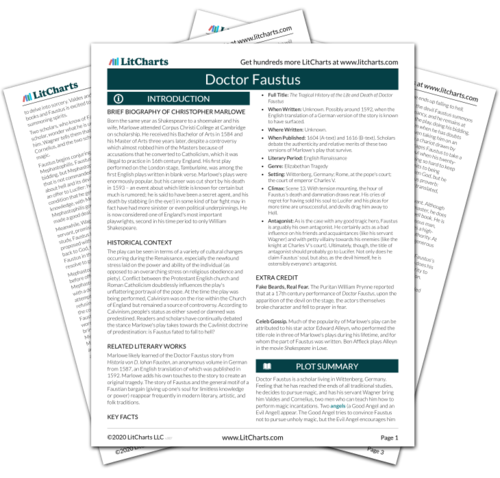 Retrieved April 25, 2019. https://www.litcharts.com/lit/doctor-faustus/scene-2.